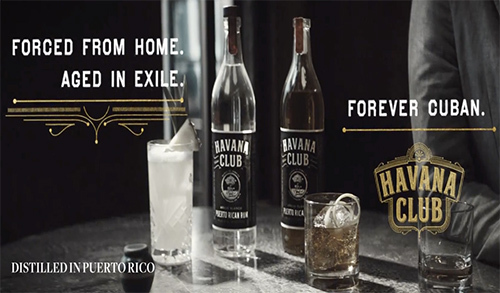 A year after relaunching the brand in the United States, HAVANA CLUB rum distilled in Puerto Rico debuts its new integrated campaign – “Forever Cuban.” Standing up to its competitors, upholding the authenticity of the rum’s Cuban heritage, and asserting its rightful place as the original HAVANA CLUB rum – “Forever Cuban” affirms that although the brand is no longer produced in Cuba, it is, and will forever be, Cuban. In the poem and the spot video, HAVANA CLUB rum proclaims its Cuban roots and boldly warns adversaries “Don’t tell us we’re not Cuban,” just because we are no longer produced in Cuba. From the small screen to reality, the “Forever Cuban” campaign sends a powerful message to all exiles: regardless of where they live, they remain a part of their homeland, reassuring consumers who share similar stories of exile that there is nothing anyone can do to take away their identity. HAVANA CLUB rum is based on the original recipe created by the Arechabala family in Cuba in 1934. In 1960, the Cuban government, under Castro’s rule, unrightfully seized the Arechabala family’s distillery without compensation and forced the family to flee the homeland they loved. After the Arechabala family was wrongfully exiled, the recipe was personally transcribed by Ramon Arechabala and given to Bacardi as part of an agreement between the two families. As a result, Bacardi has sold HAVANA CLUB rum exclusively in the U.S. since 1995. Its authenticity is maintained by the same recipe, great-taste, craftsmanship, technique and passion since the brand was crafted by the Arechabala’s in 1934. The ultimate convergence of two Cuban families coming together to continue an iconic brand’s legendary heritage with an authentic product, Bacardi is committed to continuing this legacy. Looking for a great tasting rum for your next party cocktail? HAVANA CLUB rum should be your choice. The Life of Luxury offers premier event planning services for all your special occasion needs. Hope you enjoy following our luxury blog.